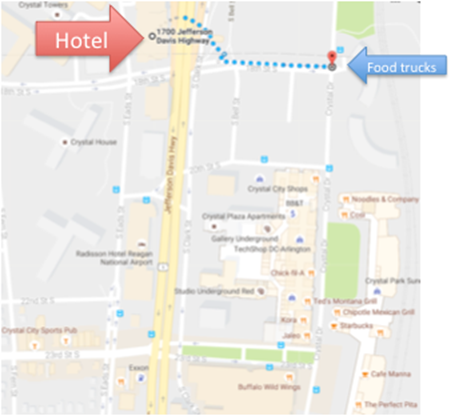 The hotel is connected to the Crystal City Metro Station through the Crystal City Shops, where you can find markets, shops, restaurants without going outdoors. Yelp: how to see which good restaurants that people are talking about: yelp it. Download the yelp app if you do not have it yet. People in DC yelp a lot. Groceries: If you prefer to go to the grocery store, there are convenient stores within Crystal City Shops that can be accessed from hotel lobby. For more options, there is a Costco, a Seven-eleven, and a Harris Teeter (grocery store near the Pentagon City metro station) nearby. Delivery: If you want your food delivered to the hotel then one option (that is different from pizza) is UberEats: https://eats.uber.com/. Make sure you enter “1700 Jefferson Davis Highway, Arlington, VA”. The delivery times range from 30 to 55 minutes, and the number of restaurants available is around 100 (depending on which ones are open at the time). Two shopping areas in Crystal City are nearby where you can find plenty of restaurants from fast casual to fine dining. 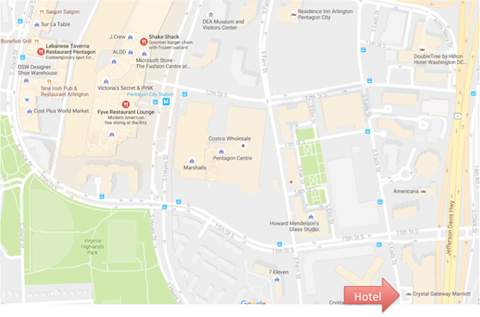 They are: Crystal City Shops to the southeast and Pentagon Row to the northwest of the hotel. Of course, dining options abound when you take metro to downtown DC. Southeast: (within 0.5 miles of the hotel): go southeast (0.5 miles) to find restaurants within walking distance. Many of them are connected to the hotel through interior pedestrian concourses of Crystal City Shops. See the map and directory at http://www.thecrystalcityshops.com. You can also find bars and restaurants to the south along the 23rd Street. Northwest: (approx. 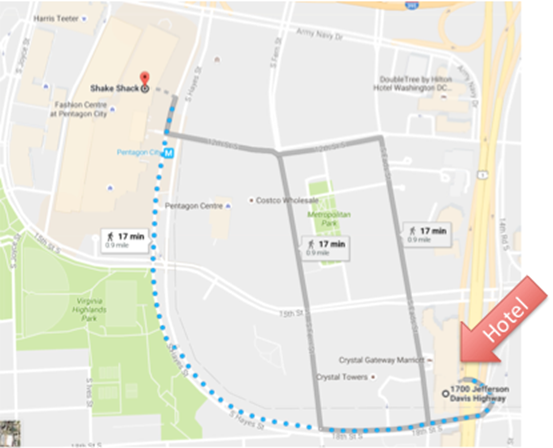 1 mile) if you prefer to walk closer to 1 mile, you may go northwest from the hotel towards the direction of the Pentagon City metro station. You can take the metro to the Pentagon City Station. Within walking distance (less than 0.2 miles) of that station there are many restaurants, some spas, and spots to drink and chat with colleagues. Check out their site here: http://pentagonrow.com/. If you prefer to walk there, it should take less than 20 min.